This collection contains approximately 10,000 albums – vast majority single LPs, some 2LP sets, some box sets. This collection was built around the word “quality” for the featured artists and condition of each album – cover, inner sleeve, vinyl. I could have ten times more albums but those rejected did not meet my high standards of quality. For example, twenty years ago out of about 5,000 LPs collection located in Massachusetts, I only bought 50+ albums, rejecting all others due to their inferior condition (among those rejected being some very rare and obscure artists, but they did not meet my high standard of quality). 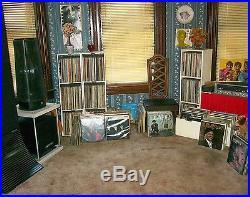 Most of these albums were played once, then placed in storage as shown in the photos. These LPs were not touched in the last ten years or longer as in the meantime I listened to additional albums bought out of curiosity (obscure, unknown artists, unusual albums) or for resale purpose. The main musical genres for this collection are the following five: 1. Rock (early, classic, hard, psychedelic, progressive, glam, punk, metal); 3. Jazz (vocal, instrumental); 4. All other genres and artists – from mainstream to obscure, rare, unknown artists – are also represented (except no disco and rap), such as: British invasion artists from the 60’s era, C&W, bluegrass, soul, R&B, reggae, calypso, doo wop, gospel, skiffle, classical, Christmas, international (from France, Spain, Italy, Latin America). About half of the albums (those played once) were placed in protective plastic sleeves. The other half only inspected for quality and placed in storage (in upright position as I keep all my albums) for future processing and listening. This collection contains many rare, obscure, unusual, special pressings LPs, all gems. Juicy Lucy – DJ / MONOAURAL pressing. Jackson Heights – White Label PROMO – Verve label. Barclay James Harvest – DEBUT ALBUM / UK EMI-Harvest. Crosby, Stills, Nash & Young – Deja vu – rare BROWN WAX LP – Holland made. The Four Buddies – Complete on Savoy – rare 2LP set. Worthington – PROMO – rare 1969 LP – complete set with BOOKLET. Joanie Sommers – Sings Johnny Get Angry and Other Top Pops – rare JAPANESE pressing album. Anita O’ Day – White Label PROMO – 50’s Verve. Lena Horne – DEBUT ALBUM – 50’s / UK made. Diane Hildebrand – Early morning blues and greens – rare SEALED 1967 LP (her only album). Elton Britt & Rosalie Allen – Starring – rare Grand Award pressing album (in shrink wrap). King – Confessin’ the blues – SEALED 1965 LP on ABC Paramount. Sarah Vaughan – The Pablo Years – rare 1984 6LP box set. Plus many other albums by unknown, obscure, one-album singers-songwriters from the 60’s-early 70’s era that many collectors / music lovers have never heard of them, rare and very rare classical music albums, and so forth. The collection contains first pressing albums, also early pressings and some reissues (for those I couldn’t find original pressings in the top condition as wanted). Most covers are in close to NM status / some Exc. Some mint, some still SEALED. The records themselves are in close to NM / NM status, some mint, some still SEALED. 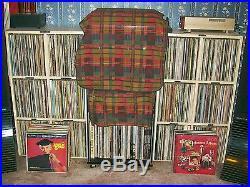 There are eight photos showing part of my LP collection. Several other racks full of albums are not shown. This LP collection must be picked up from Hartford, Connecticut, USA. I will help with the loading of the albums and the transfer of possession. If the uploading of the albums will not be possible to be finished in one day, I will make myself available for one or two more days, if needed. 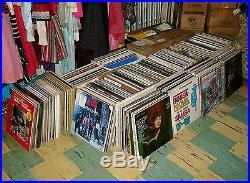 Any serious interested party may inspect this LP collection based on appointment. No list of my records LP is available as I have never compiled one due to time restraints. I have never seen a finer collection of records LP in my entire life that was built based on the value of the featured artists, variety of musical genres, and condition of the LPs. This is possibly the finest LP collection in the world in the range up to 10,000 albums. PLEASE NOTE THAT THE SALE OF THIS LP COLLECTION IS SUBJECT TO MY WIFE’S FINAL APPROVAL. Let me know if you have any questions regarding this offer. RECORD COLLECTOR SINCE 1963! The item “LP COLLECTION-APPROX 10,000 ALBUMS-FROM RECORD COLLECTOR-FINEST IN THE WORLD” is in sale since Sunday, December 25, 2016. This item is in the category “Music\Records”. The seller is “hopeaudio” and is located in Hartford, Connecticut. This item can’t be shipped, the buyer must pick up the item. This collection contains approximately 10,000 albums – vast majority single LPs, some 2LP sets, some box sets. This collection was built around the word “quality” for the featured artists and condition of each album – cover, inner sleeve, vinyl. I could have ten times more albums but those rejected did not meet my high standards of quality. For example, twenty years ago out of about 5,000 LPs collection located in Massachusetts, I only bought 50+ albums, rejecting all others due to their inferior condition (among those rejected being some very rare and obscure artists, but they did not meet my high standard of quality). 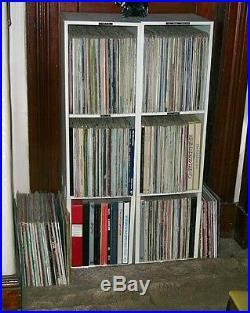 Most of these albums were played once, then placed in storage as shown in the six photos. These LPs were not touched in the last ten years or longer as in the meantime I listened to additional albums bought out of curiosity (obscure, unknown artists, unusual albums) or for resale purpose. The main musical genres for this collection are the following five: 1. Rock (early, classic, hard, psychedelic, progressive, glam, punk, metal); 3. Jazz (vocal, instrumental); 4. All other genres and artists – from mainstream to obscure, rare, unknown artists – are also represented (except no disco and rap), such as: British invasion artists from the 60’s era, C&W, bluegrass, soul, R&B, reggae, calypso, doo wop, gospel, skiffle, classical, Christmas, international (from France, Spain, Italy, Latin America). 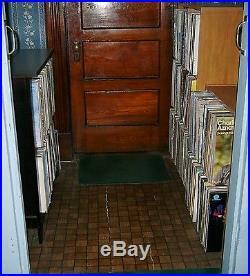 About half of the albums (those played once) were placed in protective plastic sleeves. The other half only inspected for quality and placed in storage (in upright position as I keep all my albums) for future processing and listening. 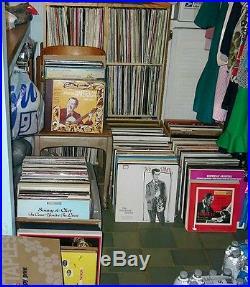 This collection contains many rare, obscure, unusual, special pressings LPs, all gems. Juicy Lucy – DJ / MONOAURAL pressing. Jackson Heights – White Label PROMO – Verve label. Barclay James Harvest – DEBUT ALBUM / UK EMI-Harvest. Crosby, Stills, Nash & Young – Deja vu – rare BROWN WAX LP – Holland made. The Four Buddies – Complete on Savoy – rare 2LP set. Worthington – PROMO – rare 1969 LP – complete set with BOOKLET. Joanie Sommers – Sings Johnny Get Angry and Other Top Pops – rare JAPANESE pressing album. Anita O’ Day – White Label PROMO – 50’s Verve. Lena Horne – DEBUT ALBUM – 50’s / UK made. Diane Hildebrand – Early morning blues and greens – rare SEALED 1967 LP (her only album). Elton Britt & Rosalie Allen – Starring – rare Grand Award pressing album (in shrink wrap). King – Confessin’ the blues – SEALED 1965 LP on ABC Paramount. Sarah Vaughan – The Pablo Years – rare 1984 6LP box set. Plus many other albums by unknown, obscure, one-album singers-songwriters from the 60’s-early 70’s era that many collectors / music lovers have never heard of them, rare and very rare classical music albums, and so forth. The collection contains first pressing albums, also early pressings and some reissues (for those I couldn’t find original pressings in the top condition as wanted). Most covers are in close to NM status / some Exc. Some mint, some still SEALED. The records themselves are in close to NM / NM status, some mint, some still SEALED. There are eight photos showing part of my LP collection. Several other racks full of albums are not shown. 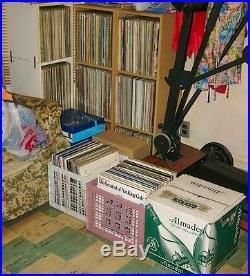 This LP collection must be picked up from Hartford, Connecticut, USA. I will help with the loading of the albums and the transfer of possession. If the uploading of the albums will not be possible to be finished in one day, I will make myself available for one or two more days, if needed. 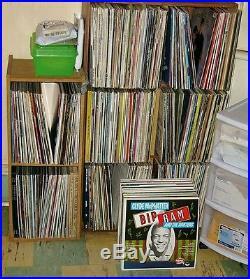 Any serious interested party may inspect this LP collection based on appointment. No list of my records LP is available as I have never compiled one due to time restraints. I have never seen a finer collection of records LP in my entire life that was built based on the value of the featured artists, variety of musical genres, and condition of the LPs. This is possibly the finest LP collection in the world in the range up to 10,000 albums. Let me know if you have any questions regarding this offer. Thank you for your time and consideration. RECORD COLLECTOR SINCE 1963! The item “LP COLLECTION-APPROX 10,000 ALBUMS-FROM RECORD COLLECTOR-FINEST IN THE WORLD” is in sale since Monday, June 22, 2015. This item is in the category “Music\Records”. The seller is “hopeaudio” and is located in Hartford, Connecticut. This item can’t be shipped, the buyer must pick up the item.